Flavored with both Kahlua and Vodka is how this cake gets it's name Black Russian Cake, this cake is very moist and delicious. 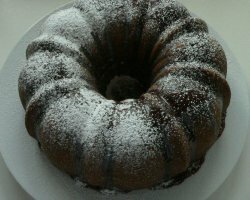 Baked in a bundt pan giving it a great appearance to the table at dessert time. 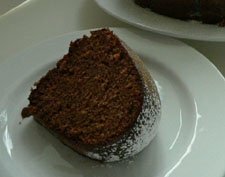 This Black Russian Cake recipe is from some 20 years ago. I suspect from a food day at work and do not remember who gave it to me. Since it was so long ago that I got the recipe, I had to make it to be sure it was good to share with all of you. I had perfect timing because some neighbors came over just as I took it out of the oven. The cake was a big hit with all and I will definitely make this again real soon. Preheat oven to 350° . Grease and lightly flour the bundt pan. In medium bowl beat all the cake ingredients together at medium speed for 4 minutes. Pour into prepared bundt pan and bake at 350° for 60 to 70 minutes. Check with a tooth pick at 60 minutes to not to over bake. Let cool 10 minutes then invert on plate. In small bowl blend together the glace ingredients, putting the Kahlua in only 1/2 at a time to get the desired consistency. Poke holes in the cake and drizzle glaze over the cake very slowly. When the cake is completely cooled, dust with powdered sugar.